In March 2014 I made a video (& shared a free pattern) how I knit a baby crown. 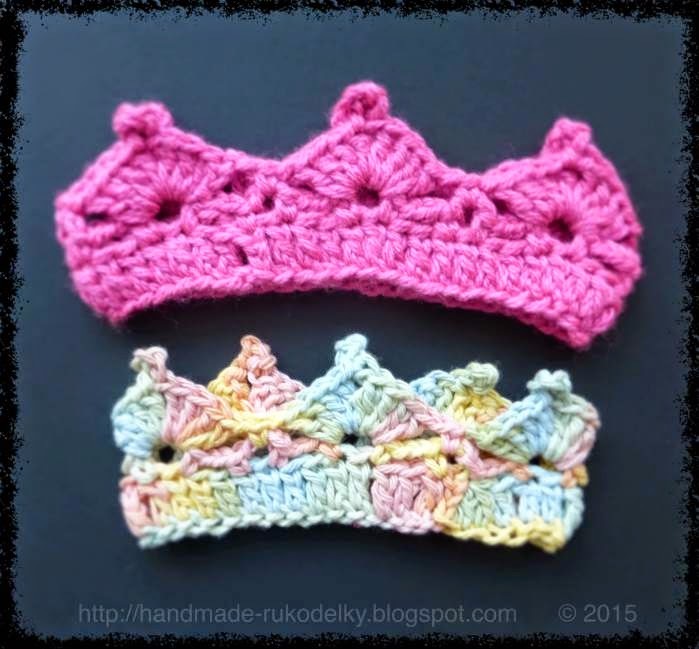 I decided that I do not want to keep crocheters out of a loop and came up with this easy pattern of crocheted crown and therefore I made another video in April '15 - for LEFTIES and for RIGHTIES. The other day a lady asked if I have a written pattern - so here it is. Share it with your friends if they like to crochet, or make it for children of your family or friends, or even if you want to sell it - it is all OK with me. Enjoy. For best results double your yarn - your crown will be stiffer, which means it will hold the shape better. Work on multiple of 8 stitches. For newborn use 40 stitches, for 3-6 months old baby use 48 sts, and so on. Foundation - 48 chain sts, connect into a circle with a sl. st.